Modern Home Products, or MHP, is one of the first makers of gas grills, and many of the features they have relied on for decades are still used in the WNK4 model, the company's most popular selling grill. From the cast aluminum body to the ceramic briquette barrier and the single piece H-type burners, this grill is from a very different era. If you are accustomed to multiple burners or lightweight grills, then this grill might seem different, but keep in mind that this grill is built to last and deserves consideration. The main thing that this grill has going for it is that it is made solid. In today's disposable society, this is a breath of fresh air—an item actually build to be durable and last you for many years to come. 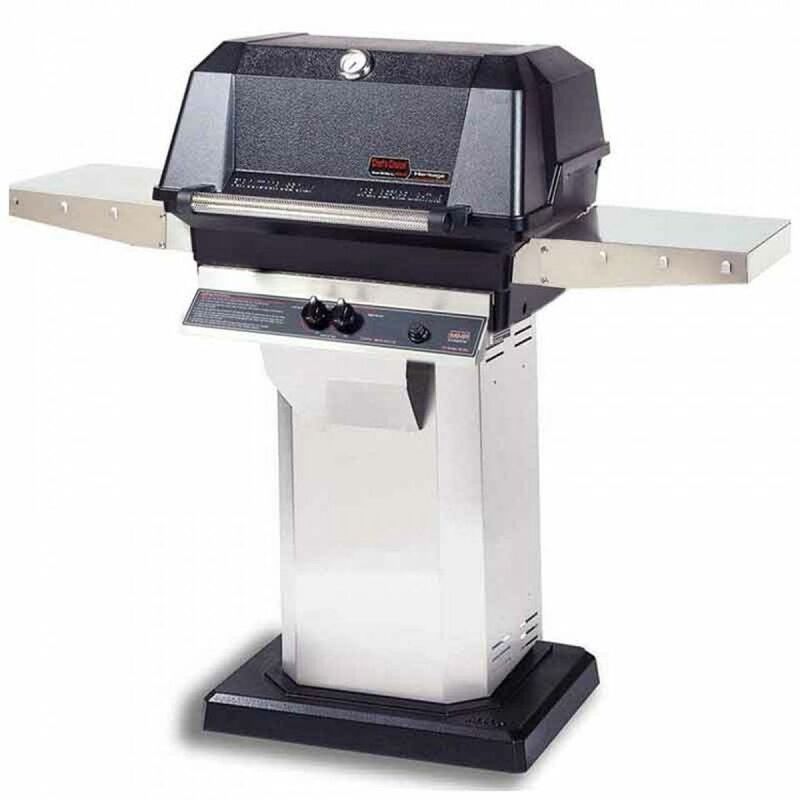 Also, it is made in the U.S.A.
With 40,000 BTU total output from the main burners, this grill has excellent heat output from its dual controlled, two-sided stainless steel H-type burner. This unit is highly customizable, with either stainless steel rod or anodized aluminum cooking grates, and convertible between propane and natural gas. One of this model's not so redeeming qualities is that it is a simple grill from a simpler time. For some, this is a godsend. Lesser options can mean fewer things to think about. However, if you are used to all the bells and whistles, then this grill might not be for you. Another thing, the cover, and propane tank are sold separately. The price might be considered a negative if you are looking in the neighborhood of a $500 grill. The WNK4 averages at about $1,200 as the starting price. Although, if you choose not to buy another grill for a long while, then the WNK4 would be considered a good deal since, in all likelihood, it will outlast many cheaper models for years to come. Long ago, if a person wanted a gas grill, they would contact their gas company that carried a few models and would install them in the yard for the price of the grill. These units were solidly built from heavy cast aluminum with heavy cooking grates and a simple design. MHP was one of these suppliers long ago and this grill is, in many ways, identical to that style of grill. The MHP WNK4 uses a single unit H-type burner that has independent controls for each side. Basically, this is a two burner grill with 20,000 BTUs on either side of 433 square inches of primary grilling space for a total cooking area of 642 square inches. Because of the heavy construction, ceramic briquette barrier, and solid cooking grates the heat is both efficient and very high. The ceramic barrier is designed to catch and burn away drippings, protecting the burner, but it can also cause flare-ups from time to time. An experienced griller can deal with these issues, but it is important to be prepared for it. This grill is highly customizable. It can come with either stainless steel rod cooking grates of anodized aluminum grates. Aluminum is recommended. Aluminum is better at transferring heat and can last for decades. Other options include the type of side tables and mounting options. This is one of the few gas grills that are still on the market that can be permanently mounted on a metal post like grills from the 1960s. The gas grill may look primitive, but it has a cast aluminum body, making it very sturdy, and it does have most of the options that any other grill can provide. It has an electric AA-battery ignition. A side burner and an infrared rear-mounted rotisserie burner is available making this as modern a grill as any.